This classic, smoky-flavoured marinade is very versatile – it’s delicious served as a dipping sauce for fries too. The sauce can be made up to five days ahead of time; simply store it in a screw-top jar in the refrigerator. 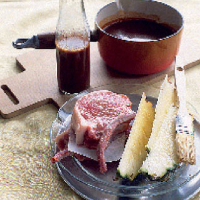 To cook- If barbecuing, sear the meat on both sides – or blanch the ribs – then brush with the marinade before cooking. If you’re roasting a whole chicken, rub the sauce all over and cook at 200˚C/gas 6 for 1–1½ hours. This recipe was first published in August 2007.